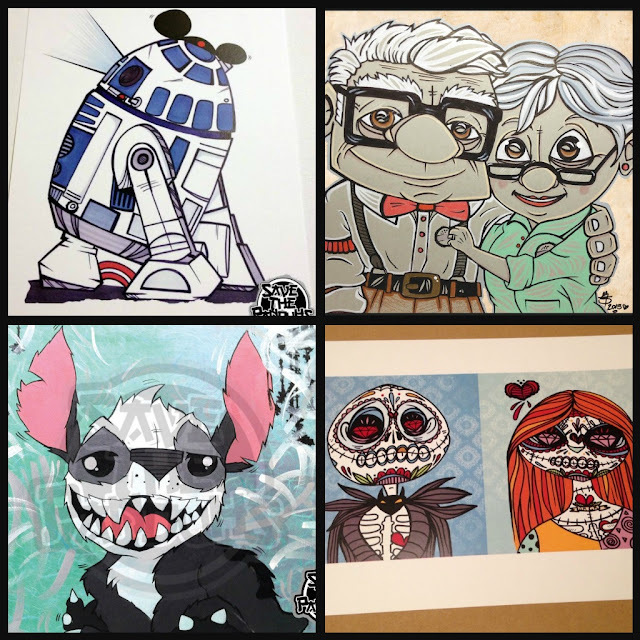 If you follow us on Instagram or Facebook then you know that we have a thing for artwork. I think that if we had all the money in the world our house on the beach would be filled with artwork. There would even be art work on our yacht. Even on our tight budget we make it a point to collect art when we can. For our 9th anniversary we decided to invest in a piece of artwork instead of gifts to each other. I don't know why we didn't think of this earlier. Deciding what to get was easy. 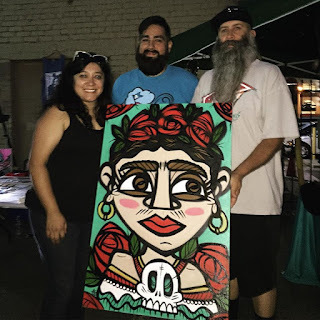 We have been going to Riverside Art Walk for a few years now and one of our favorite artist booths is Save the Panduhs also known as Rick Garcia. His work it a a bit Disney with a touch of bad-assness. Here is some of his work.. He does a great job of offering of a variety of items with his artwork. Think t-shirts, bags, patches, hats, candles, and even dresses. The girls have been collecting buttons, Louie has a t-shirt and I have a candle. Click the picture to head over to Save the Panduhs website! For our anniversary we decided we wanted an original painting. 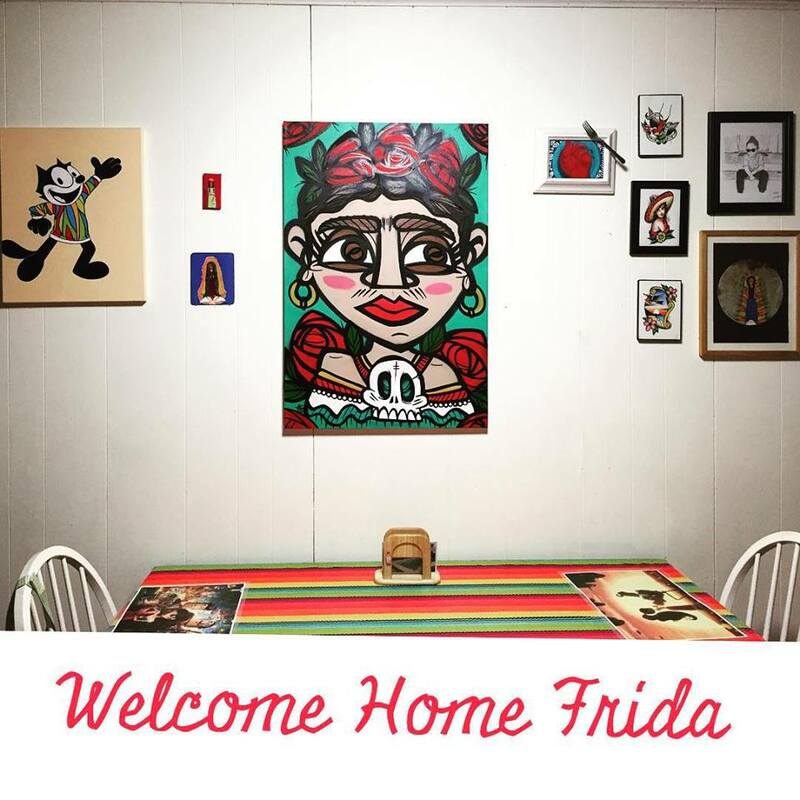 At the time Save the Panduhs was offering a 2x3 canvas painting for a really good deal so we jumped at the chance and asked for a painting of Frida. Or as Save the Panduhs calls it Friduh! 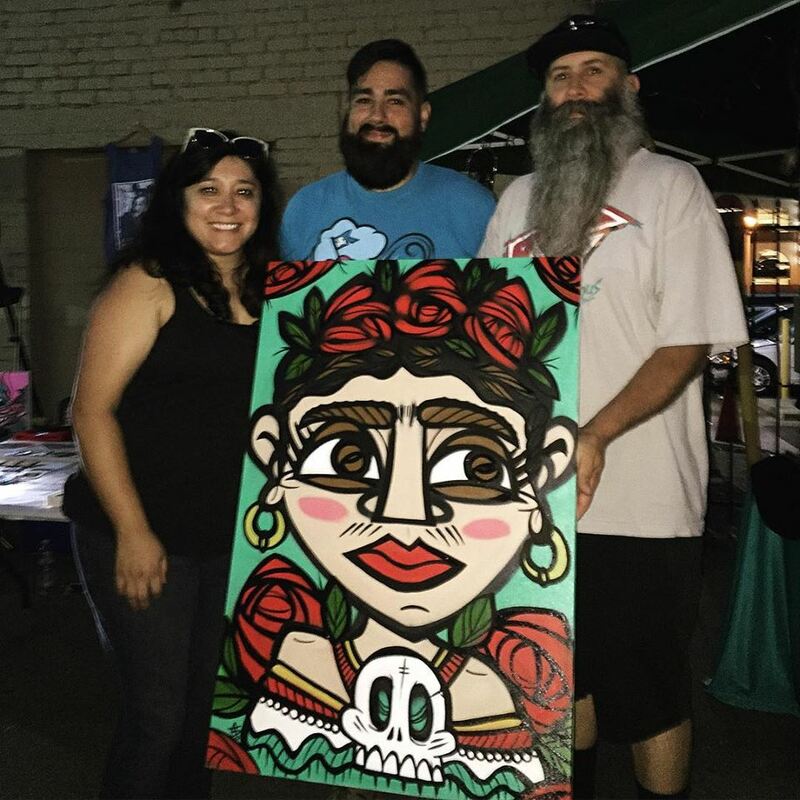 Waiting was the hardest part but a few weeks ago we meet up at Riverside Art Walk and picked up our piece. 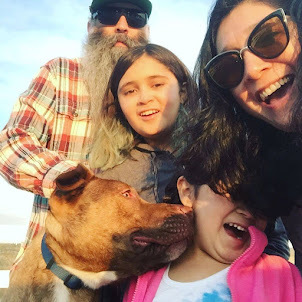 We could not believe how incredible it turned out. So much more than we ever imagined. We instantly fell in love and could not wait to get it on our wall. We got home and hung it up and we all just stood there and stared at it for a long time. Louie could not believe that she gets to look at it everyday. I thought the same thing. Joey has been designing a frame in his mind. Think red and glitter. Thank you so much Save the Panduhs. You can see all his current work in his Instagram page.